Spaulding Youth Center commemorated National Autism Awareness Month with a special celebration held during its weekly school town hall. Students, staff members and supporters gathered together to spread awareness about Autism Spectrum Disorder (ASD) and to celebrate acceptance, understanding and love. Students and staff enjoyed refreshments and the sentiment of unity. To add to the festivities, students and staff were presented with blue Spaulding Youth Center Autism Awareness shirts to wear during the celebration. With most attendees proudly wearing this shirt, the result was a visual demonstration of campus-wide unity and acceptance for Spaulding students and people everywhere diagnosed with ASD. 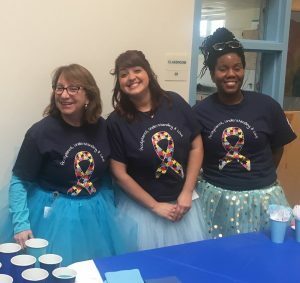 Attendees were also encouraged to participate in “Tutu Tuesday” by wearing a blue tutu for the celebration and on every Tuesday in April. To make a donation in support of autism awareness and those students with Autism Spectrum Disorder who we support every day, please visit https://www.spauldingyouthcenter.org/give/ or contact Cheryl Avery at cavery@spauldingyouthcenter.org or 603.286.8901 ext. 107.